Even though my girls are getting older and moving onto more "big girl" type shows and movies, one of the first animated series they watched as toddlers continues to be a favorite among the two of them -- Chuggington. 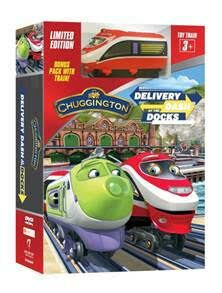 Do you have a Chuggington fan in your life? If so, then you have probably sat and watched a few episodes (probably more) of this cute series, which follows three chuggers in training, Brewster, Koko, and Wilson, as they learn the ropes on how to be Chuggers in Chuggington, all while learning lessons along the way including the important of friendship, teamwork, and never giving up. So, when my girls saw the new Chuggington DVD (with toy engine) arrive at our doorstep, they were over the moon excited and couldn't wait to watch it. Thankfully because we have so many Chuggington chuggers, they didn't fight over who would get the new special Daley collectible toy train, which is included in specially marked boxes. Instead, like the chuggers in training, they shared and played together with the new toy, as they settled in on the couch to watch this new release. "A special delivery of traintastic fun is coming down the tracks for young trainees all across the country this season with “Delivery Dash at the Docks,” the newest release in the much-loved “Chuggington™” DVD collection. The brand-new title from Anchor Bay Entertainment contains six standout episodes from the fifth season of the top-rated Disney Junior series as well as trainloads of exciting bonus features. The DVD features two new characters, Daley and Skipper Stu, and is available with a very special Daley collectible toy train from TOMY™ to give preschool fans and their families even more to honk their horns about! “Delivery Dash at the Docks” moves full steam ahead to retail nationwide on February 23, 2016. Now in its fifth season on Disney Junior, “Chuggington” is a colorful and contemporary CGI-animated TV show from Ludorum that reinforces early social readiness skills. The series has become a global sensation since its debut in September 2008 in the U.K. The show has been licensed to more than 175 territories worldwide and has established ratings records in several key international markets, including the U.K., Germany, France and Australia. The series made its U.S. debut in January 2010." This new release does a great job in teaching little ones about being a good friend, helping those in need and team work. From start to finish, both of my girls stayed engaged and loved every minute of this new Chuggington DVD. They loved seeing Koko working with Daley, Chuggington's newest express engine. Bella was excited to see Skipper Stu on this DVD as she likes the name and giggles every time she sees this new Dock Master to Chuggington station. Both of my girls highly recommend this new DVD release, as when asked, they gave two big thumbs up, as they grinned from ear to ear. So, it's a winner in our house, and will be in yours, too! This sounds like a fun one and the kids love trains. My grandsons love to watch Chuggington! These sound like great episodes!